We’ve had a really good month as it turned out. I didn’t think it would be the case half way through the month. We close off our month on the last Sunday of each month, this allows us to always restock, so we include all the costs for achieving the profit. That being said, prior to MoP we were purchasing a lot of materials cheap with the expectation that there would be huge inflation upon release. This month we are seeing the benefits of those decisions. I use the term Sales below because a lot of costs were incurred in the previous month, which aren’t deducted this month to work out profit. We were also farming a lot of our own herbs for DM Cards and the value of the herbs isn't being taken into account. 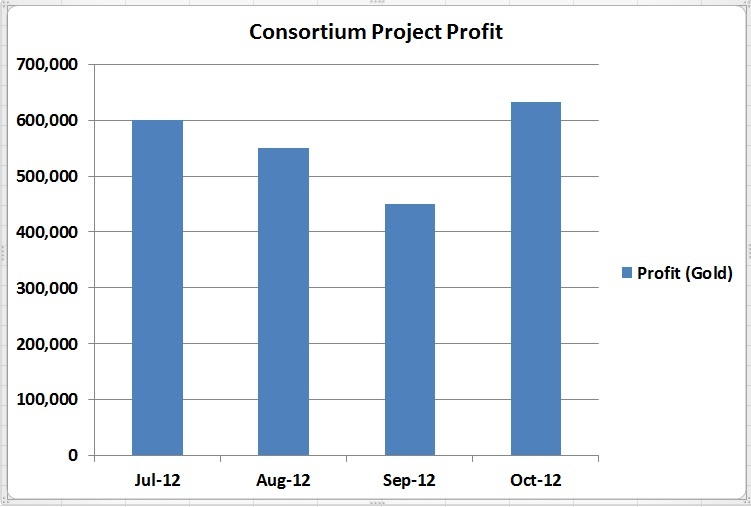 Total Profit of 632,067 gold for the month, which is a new record for the Consortium Project. Special thanks to xsinthis of the Golden Crusade for his work on The Golden Crusade Shuffler. Although I don’t use the spreadsheet, his yield values drive our costing data. We backed a winner on Netherweave & Embersilk Cloth, our sales this month were 53,263 gold from bags. That’s a lot of bags. We are getting 20-25g for Nehterweave Bags & 300-350g for Embersilk Bags. I am only now, considering selling all the enchanting mats I purchased cheap prior to MoP, which we have a lot of. It’s taken a while for all the excess stock of my competitors to be used up. Again we backed a winner, buying out all the cheap Whiptail and turning them into Inks has worked out brilliantly. We still using up all the stock we exchanged, and have approximately 3 months supply sitting in storage. This is a great advantage now that Herb prices are through the roof. Glyph Sales accounted for 136,196 gold. I did a post DarkmoonFaire Fail. The fail part was referring to Blizzards failure to change the Ink vendor when MoP went live. I didn’t communicate this particularly well so some readers misconstrued my meaning which I apologise for. Sales accounted for 158,000 in DM Cards. But maybe the title was a premonition of what was to come, not naming anybody, but someone in the consortium project put up a Tanking DM card on the AH for 300g, instead of 30,000 gold and blamed TSM for the glitch. Moral of the story check your high price posts before you walk away from the AH. Needless to say some tank is a happy camper today. Profit on this was 284,608. Having 3 Alchemists making belt buckles (2 Transmutation Masters) meant we were able to make 3+ per day of Living Steel. I was also purchasing a lot of Living Steel off the AH, thus keeping the price high. A mate turned these into Belt Buckles for us and they sold really well. Enchants are now selling really well, took a while for people to level to 90 and start doing heroics. I’m baffled why people would sell Gems & Flasks at below cost. I thought that Golden Lotus would set the price of Gems and Flasks but that doesn’t seem to be the case currently. Maybe it’s because with Exalted Tillers rep people are able to make 1.6 Spirit of Harmony per day and exchange them for Golden Lotus. Maybe demand is still rising for Gems & Flasks but sometime soon prices have to reset. I didn’t start selling gems until late in the month. Rings and Necklaces have sold really well. I even sold a Sapphire Panther for a nice 4k Profit. Flasks are great on Raid Nights but early in the week, that are pretty dead. I had to revise my notion on buying out Golden Lotus to 300g and selling heaps of flasks, there just isn’t demand. One of my goals for this expansion is to make 1,000,000 in a month. For that to be a reality prior to Blizzard making Mote/Spirit of Harmony tradable, I’m going to have to level up my JC & Enchanter on Horde side in preparation. Get ready Horde, here comes the pain.